Betty J. (Winney) Cummings Baldwin, 86, of Topeka, was called home to heaven Saturday, March 23, 2019. She was born July 30, 1932, in Beattie, Kansas, the daughter of Verne and Freda (Blumer) Winney. She graduated from Topeka High School in 1950. Betty retired from the State of Kansas in the Department of Revenue. 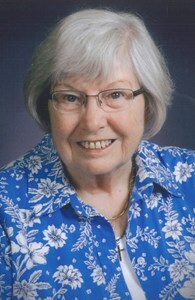 Betty was a lifelong member of the Oakland United Methodist Church and was very active in UMW. Her favorite pastime was enjoying her grandchildren and great-grandchildren’s activities. She loved her Royals and Jayhawk Basketball. Betty married Donald Cummings on June 12, 1951 he preceded her in death on July 17, 1978. She then married Harold Baldwin on February 27, 1981 he preceded her in death on May 6, 2015. Survivors include daughters, Patti (Thom) Taylor; Kathy Cummings; brother, James Winney, the ones that knew her as grandma, Nathan (Jenny) Taylor, Jered (Teresa) Taylor, Jolene (Cory) Flowers; the ones who knew her as GG, Harry Taylor, Ollie Taylor, CJ Flowers, Charlie Taylor. She was also preceded in death by her parents; son, Michael S. Cummings, sister, LaVon Hedges, and a brother, Robert Winney. A memorial ceremony will be at 10:00 am, Friday, March 29, 2019 at Parker-Price Cremations, Funerals & Receptions, 245 NW Independence Ave., Topeka, KS 66608. Memorial contributions may be made to Midland Care 200 SW Frazier Circle Topeka, KS 66606. To share a memory of Betty or leave a message for her family, please click the Share Memories button above. Add your memories to the guest book of Betty Baldwin. My beautiful aunt Betty. God bless you and your family. I am so sorry to hear of your passing. Please know that Vickie and I and our kids and families are thinking and praying for you all. We wish we could get back to Topeka but we are so busy with grand kids and life in general. We are so sorry for your loss. May you rejoice in the memories you have made with Betty...I know they are many.